Can You Survive on Meal Shakes? Liquid diets are meant to be a temporary diet. Whether you're taking meal shakes to lose weight or as a food complement, they are not meant to be used as a permanent substitution. Meal shakes come in all forms and shapes, from over-the-counter, sweet canned shakes to prescription shakes for special medical conditions. If you want to completely give up solid foods and switch to meal shakes, talk to your doctor or a nutritionist first. 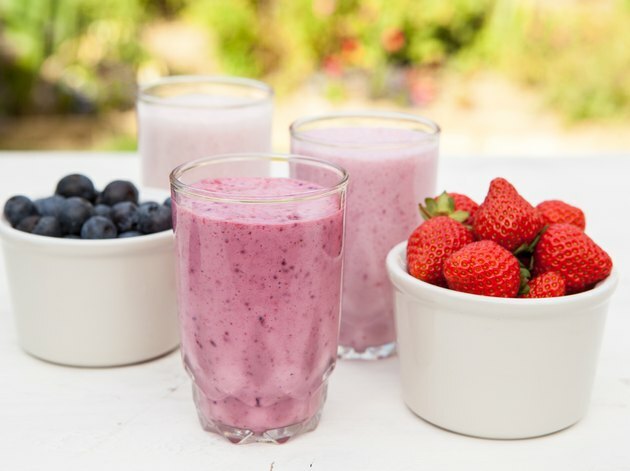 Meal shakes are often a good choice for obese people, according to Vanderbilt University. Prescription liquid shakes such as Medifast and Optifast are balanced shakes used for quick weight loss. This is sometimes necessary for very obese people who have medical problems aggravated by their weight. By losing weight rapidly, they might lower their blood pressure or blood pressure, improving their health. These prescription shakes provide a total of 400 to 800 calories per day and can be taken for up to three months under medical supervision. The shakes provide all necessary nutrients, so you can survive on them, without any additional food intake. Replacement meal shakes such as Slim Fast and Met-Rx are meant for weight loss. You're not supposed to replace all your meals with shakes, but instead drink one for either lunch or dinner and then eat a sensible meal for your other meal. However, you could technically survive on these shakes, as they contain balanced nutrition. For example, an 8-oz. can of French vanilla Slim Fast contains between 25 and 100 percent of your daily needs for vitamins A, D, K and C. It also contains calcium, potassium and phosphorus. It also contains fiber and protein. Some meal shakes are especially designed to provide nutrients to people who cannot eat solid foods. Products such as Boost, Carnation Instant Breakfast and Ensure are often recommended for elderly patients or those who are bedridden or in pain and refuse to eat regular meals. These are balanced to provide all nutrients you need on an everyday basis. If you're going to switch to a completely liquid diet, these particular shakes provide the most nutrition. One of the problems with meal shakes is that many contain high amounts of sugar, according to registered dietitian Kathleen Goodwin in an article for The Diet Channel. Corn syrup and other sugary add-ons are a common source of calories in these shakes. This is very different than eating complex carbohydrates and other whole foods as a source of calories and nutrients.